Belleek standing Celtic cross is crafted of fine Irish china that is enhanced with green shamrocks along with an embossed motif. 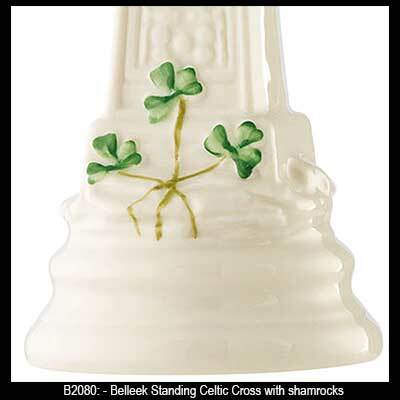 The Belleek standing Celtic cross is enhanced with embossed detailing. 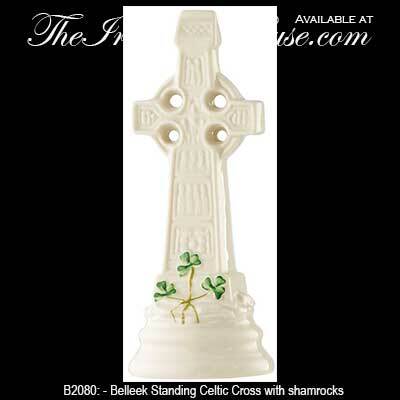 The Belleek standing Celtic cross measures 7 1/2" tall and is enhanced with hand painted green shamrocks. The fine Irish china cross is hand crafted in Belleek, Ireland and is gift boxed with shamrock and Celtic cross history cards, complements of The Irish Gift House.